Could this be why men dominate the grill? Men love meat and ladies love sweets. Right? These stereotypes are near-effortless to buy into, particularly in the U.S., where marketers have played them hard, and consumers have adopted them as their own preferences and truths. The perception is as follows: Women are to subsist on salad (and chocolate, sometimes) and men are to fill their plates with meat and savory dishes. Just take a glance at the chocolate advertisements below. In all four commercials, chocolate is branded as a sinful treat that women (thin, attractive women -- but that's a topic for another day) consume because they just can't resist. And here, four masculine meat commercials. In these ads, men are either behind the grill or eating meat products. In Burger King's commercial, the Texas Double Whopper is advertised for strong men who can push cars over bridges and can't subsist on "chick food" like quiche. So, do women really enjoy chocolate more than men do? The answer's a little complicated. Forty percent of women in the U.S. report chocolate cravings, while just 15 percent of men lust after it. And maybe unsurprisingly (depending on who you are), "half of the women [in the U.S.] who crave chocolate say they do so right around menstruation," Dr. Julia Hormes, an assistant professor of clinical psychology at the University of Albany told The Huffington Post over the phone. Chocolate and PMS are closely associated, which had Hormes wondering if menstruation causes the craving. Is it a biologically-instilled hankering? Are women deficient in certain nutrients in the days leading up to their period that lead them to desire chocolate? No. In a study she published in Appetite in 2011, "These biochemical, physiological hypotheses didn't pan out." So then, why do women hunt down a brick of Godiva to survive cramps and bloating? "There's a strong influence of culture," Hormes said. The commercials above say it all. Chocolate is marketed as a way for women to deal with negative emotion (like, say, the stress and headaches that come with PMS), Hormes said. It is an "indulgence" because it is an exception to the rule -- women who diet and subscribe to a certain ideal of beauty should only consume chocolate when they "need" it. Only in America. In Spain, for example, women don't report craving chocolate perimensturally nearly as much as women in the U.S. do. It's not that Spanish women have a different make-up to their cycle, it's really that tampon and chocolate ads aren't aired during the same commercial break. In the U.S., it seems, there's something so strongly feminine about chocolate that fewer men report wanting it. But, "Spanish men are almost as likely to crave chocolate as Spanish women." In Egypt, neither men nor women really report craving chocolate; "They tend to crave savory foods," Hormes said. Our conflicting relationship with chocolate is a culturally-manufactured one. Men get the short end of the cultural-perception stick when it comes to vegetables and healthy eating (though this is evolving as health is increasingly a priority for Americans, as more than one-third of U.S. adults are obese). While meat is commonly associated with masculinity, there's no striking biological evidence than men need more meat than women (just typically more calories and protein, due to their larger size). This misperception developed from a historical and evolutional account -- men were hunters, women were gathers (but hey -- they didn't really pluck chocolate bars from the ground). Women do dominate the greener eating space; just 41 percent of the 7.3 million Americans that are vegetarian are male, according to the Vegetarian Times. 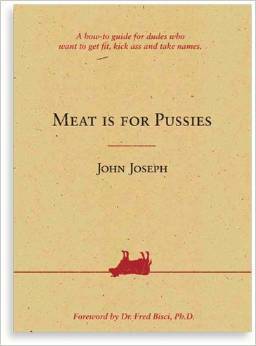 There's this curious sub-trend sprouting among vegetarian and vegan men: The book, Meat Is For Pussies, is a how-to guide targeted men who want to get fit on a plant-based diet. It is not a subtle example of how some are trying to re-market the vegetarian space as masculine. In an NPR feature, "For These Vegans, Masculinity Means Protecting The Planet," one male vegan, who also happens to be a triathlete, relents, ""Everyone always thinks vegans are weak, skinny, frail, pale." He and his fellow vegan friends are interviewed about their vegan barbecue in Brooklyn, N.Y. In the feature, the group poses while flexing muscles, exposing tattoos and appearing generally "tough." They're almost Popeye-esque. "We use food to make judgments about people all the time," Hormes said. Humans naturally label people and things to make sense of the world, but maybe, when armed with more information, we can start moving toward a more gender-neutral view of the grocery store.